The three-volume Encyclopaedia of Equestrian Exploration is the most extensive study of equestrian travel ever created. The first and second sets of the Encyclopaedia were presented to Great Britain’s reigning monarch, Her Majesty, Queen Elizabeth II, and to the future king, His Royal Highness, Prince Charles, both of whom exerted a profound influence on the creation of the books. Former generations of horse travellers took the basis of their equestrian knowledge for granted. For centuries they passed on wisdom in an oral tradition, never foreseeing the day when horses would be replaced as the primary mode of transportation. The result was the loss of humanity’s collective equestrian travel wisdom. A treasure trove representing more than 6,000 years of cumulative human-horse travel experience was lost in less than 100 years due to global apathy. Thus as the 20th century came to a conclusion mankind knew more about the surface of the moon than it did about the once-vital topic of horse travel. CuChullaine O’Reilly, the Founder of the Long Riders’ Guild, realized there was an urgent need for accurate equestrian travel information. He spent more than thirty years searching the world for this endangered equestrian knowledge. Early in his search CuChullaine was told by James Allen, the world’s most respected equestrian publisher, that no such comprehensive study had ever been attempted. Nothing of an international nature had yet been created. According to Allen there were only two types of available texts. A few travellers had left accounts of their individual journeys. But these were intended as entertainment. Any information had to be carefully extracted from amidst hundreds of pages of narrative. The only exceptions to this rule were two obscure and out of print studies written in French and German. But these were based upon the authors’ limited travels and did not take into account the immense knowledge of other Long Riders. Plus, because they were penned in the late 20th century both volumes were badly out of step with the new internet age. O’Reilly began work in the autumn of 2010 thinking that in a few weeks’ time he would compose a Handbook which contained a primer of equestrian travel knowledge. “Looking back upon that moment in my life, it is fair to say that my ignorance was only matched by my naiveté. I was one of those would-be equestrian travellers who belong to the ‘lost generation’, those born in the mid-twentieth century who were too late for the cavalry and too early for the internet. The Handbook kept growing until it became so large that the author realized that there was a need for two books - one to be studied at home prior to departure (The Encyclopaedia of Equestrian Exploration) and a smaller cavalry style manual designed to accompany the Long Rider during his journey (The Horse Travel Handbook). After six years of uninterrupted work, O’Reilly completed the three-volume Encyclopaedia of Equestrian Exploration. With the assistance of Senior Long Riders from around the world, it required an additional year to proof-read, copy-edit and lay out the project. The completed work serves as an equestrian Rosetta Stone that chronicles the ancestral story of the Long Riders. 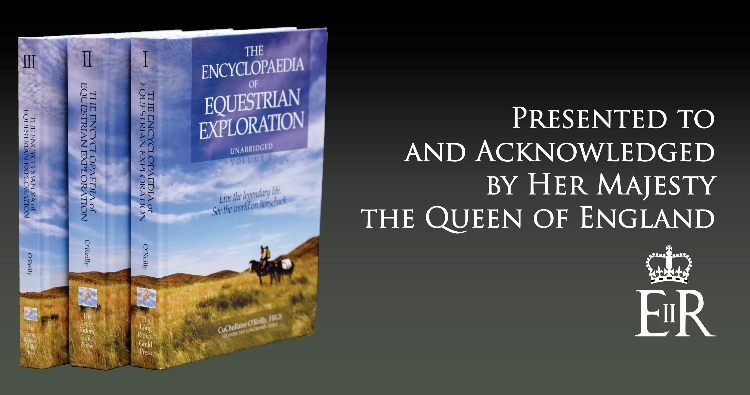 The Encyclopaedia of Equestrian Exploration is not the limited personal view of the author. It is not the recollections of a single traveller. It does not promote the superiority of one race or culture. For the first time in history the books written by Long Rider authors are honoured in an extensive Bibliography which includes more than 200 titles dating back hundreds of years. The Encyclopaedia’s publication in 2017 coincides with the 400 year anniversary of the birth of equestrian travel literature, which began in 1617 when Fynes Moryson wrote about his ride through Europe. The Encyclopaedia's 1,800 pages are enriched by nearly a thousand images, drawings and photographs. Volume 1 consists of The Preparation, The Horses and The Equipment, Volume 2 consists of The Challenges and Volume 3 consists of The Journey, The Aftermath and The Epilogue. As might be expected this comprehensive book offers every conceivable type of advice about the basics of equestrian travel such as how to plan a route, how to choose a travelling companion, how to find a road horse, how to load a pack saddle, how many miles to travel per day, how to feed and shoe your horse, how to cross rivers, how to negotiate borders, how to survive in traffic, how to deter horse thieves, etc. Thus the Encyclopaedia of Equestrian Exploration is a book containing hundreds of pages of practical wisdom gained from the travels of the greatest equestrian explorers. It is also a guidebook that explains that state of mental tranquillity described as The Long Quiet. The wise Long Rider knows he is setting off on two journeys, the external and the interior, that he will be required to travel along the parallel streams which run through every equestrian journey, the practical and the philosophical. Both require careful study. A few books have addressed the practical aspects of horse travel. But no one has examined the philosophical side. The Encyclopaedia of Equestrian Exploration doesn’t just tell you how. It reveals why. HRH Prince Charles provided the spiritual inspiration for the Encyclopaedia. His profound influence can be seen throughout the book, and he is specifically quoted and thanked in the Epilogue, which addresses issues that confront us all as human beings. This unique work represents an Ark, not of animals two by two, but of mankind’s equestrian travel knowledge, consisting of every scrap of wisdom found in ancient tomes, the lessons learned from countless miles, the practical knowledge garnered from generations of horse-humans, our species' collective equestrian evidence gathered together for the first time, preserved, and presented to posterity. It is a book that serves as a bridge to mankind’s collective equestrian travel heritage. Its message transcends nationality and time. The Encyclopaedia has also been reviewed in the international equestrian news service, Horse Talk, which has generated many positive comments. To learn more about the author, CuChullaine O’Reilly, and the publisher, Basha O’Reilly, click here.